Free shipping. Buy direct from HP. 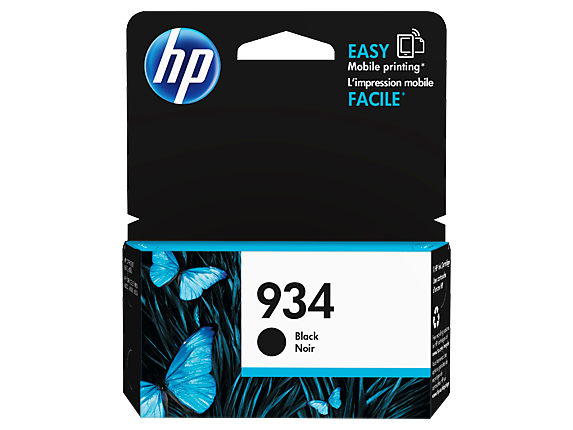 See customer reviews and comparisons for the HP 934 Black Original Ink Cartridge. Upgrades and savings on select products. Original HP inks are formulated to consistently produce text and graphics documents at a great value. Count on outstanding prints from cartridges specially designed to work with your HP printer. Represent your business best with Original HP inks—designed to consistently deliver sharp black text.Prints on plain papers using HP pigment black ink for HP OfficeJet printers stay legible for many years. Preserve your work. Rely on Original HP inks for durable  prints that resist water and last for decades.Count on eye-catching, professional results that last,  with ColorLok® papers designed for the office. Represent your business best with Original HP inks—designed to consistently deliver sharp black text.Prints on plain papers using HP pigment black ink for HP OfficeJet printers stay legible for many years.Preserve your work. Rely on Original HP inks for durable prints that resist water and last for decades.Count on eye-catching, professional results that last, with ColorLok® papers designed for the office. 1 Based on HP internal testing. See http://www.hp.com/go/printpermanence. 2 Based on HP 934XL High Yield Black Original Ink Cartridge. See http://www.hp.com/go/learnaboutsupplies. High-yield cartridges not included; please purchase separately. Value compared with estimated street price and page yield of standard-yield HP 934 ink cartridges. Actual pricing may vary. 3 HP Planet Partners Program availability varies. Visit http://www.hp.com/recycle. 4 Program features and availability may vary by country. For more information, visit http://www.hp.com/learn/suresupply. Not compatible with Windows® 2000. 5 Program features and availability may vary by country. For more information, visit http://www.hp.com/learn/suresupply. Not compatible with Windows® 2000.